Includes information about county commissioners, government offices, trustees and elected officials. Includes information on parks and recreational events and activities. Information on the political infrastructure of the county. 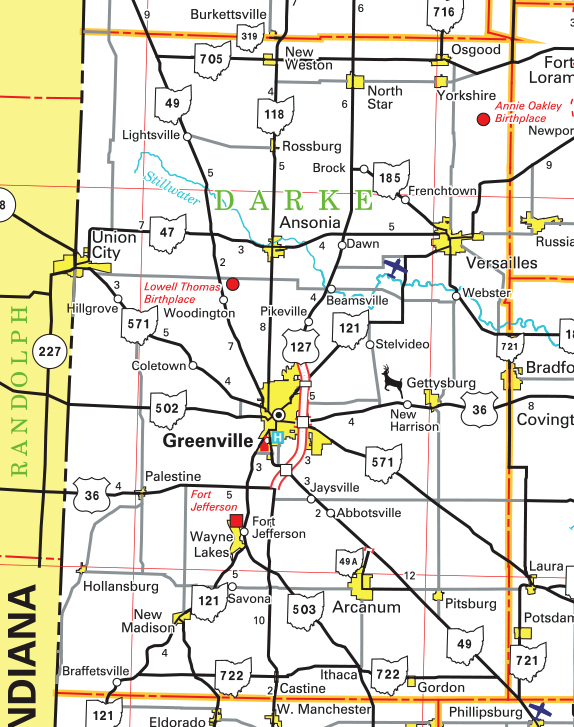 Ohio Department of Transportation map of Darke County. Provides overview, photos, and job information. Site contains information on the political history of Darke County, cemeteries and memorial sites in the county. Includes schedule and information about the fair and other events held on the fairgrounds in Greenville. Provides local news, sports, classifieds and business information. Offers live and previous election results. Also provides the election calendar and information about the board, voter registration and pollworker employment. Branch office of Ohio State University, it combines the needs of local citizens and communities, with new research and technical information. Includes information about local fairs, festivals and events, recreation, shopping, and lodging. Includes county history, church, school, and business index.